Easter is almost here! ALMOST HERE!! That also means it's past the time to get out your obnoxiously colored decorative flags. And grab those ducks, bunnies and chicks! Don't you know that the moment the holiday before it is over, you must immediately and quickly pack all the crap away and switch to the next holiday? RIGHT AWAY!! YOU MUST DO IT! So, you know what that means, right? I haven't done a LICK of decorating for Easter yet. Not that Easter is a big holiday at my house in general but I like excuses to buy and make things, too! Even though it's not a big holiday for us, we always seem to end up with an overabundance of plastic Easter Eggs. I'm pretty sure I don't buy them every year but somehow they are multiplying. They must be bunny eggs (shhh....don't ruin my delusion that bunnies don't come from eggs). And because the kids love them, I always end up with too many. In fact they plague our house for months afterwards because the kids have secretly squirrelled them away. This is only about half of what I found. Overabundant plastic Easter Eggs = Easter Decorations. This is my solution. Scrap of fabric- mine was a little over half a yard at 20 x 45 inches. 1. 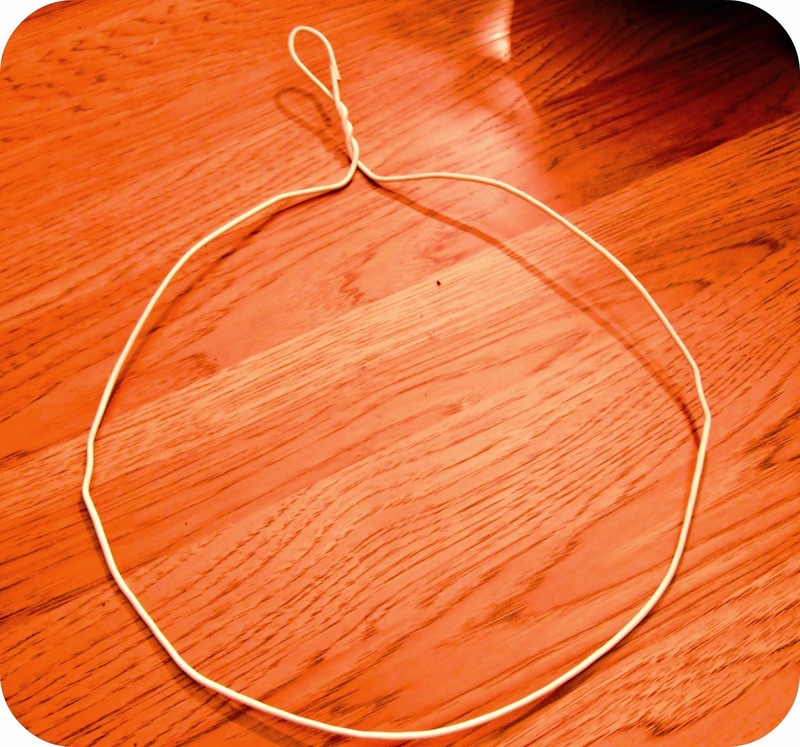 Bend your first coast hanger into a circle shape and bend the hook down to form a loop. 2. Untwist the other two coat hangers at the top and straighten. Braid your straightened coat hangers onto the wire circle weaving back and forth. Then using your pliers wrap the ends around the form for secure. 3. Grab your fabric and scissors. 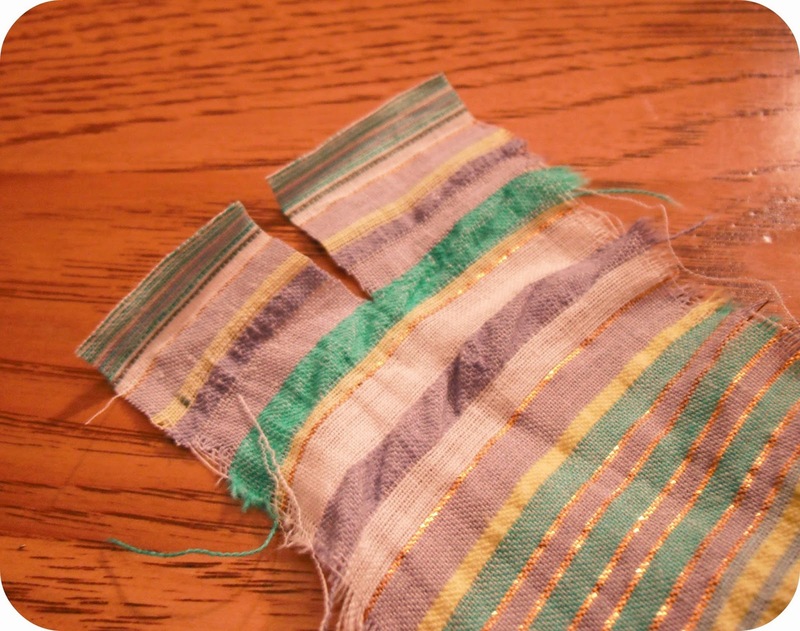 Clip your fabric on the selvage edge about every two inches and tear on the grain across. 4. Pick up your first fabric strip and clip into the end to make two tails. Tie those tails onto the wreath starting right next to the hook. 5. 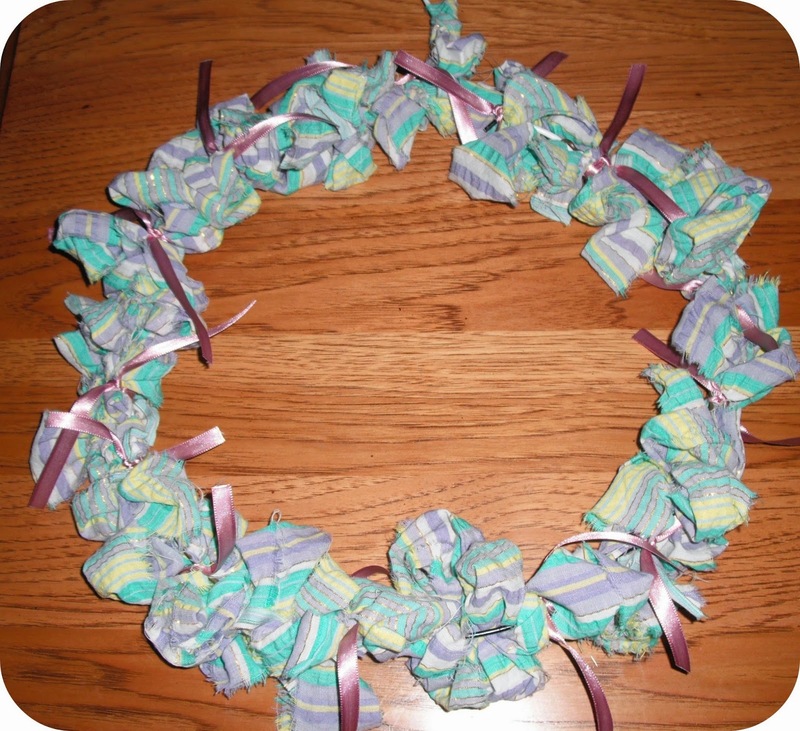 Weave your fabric strips in and out of the wreath making little loops as you go. 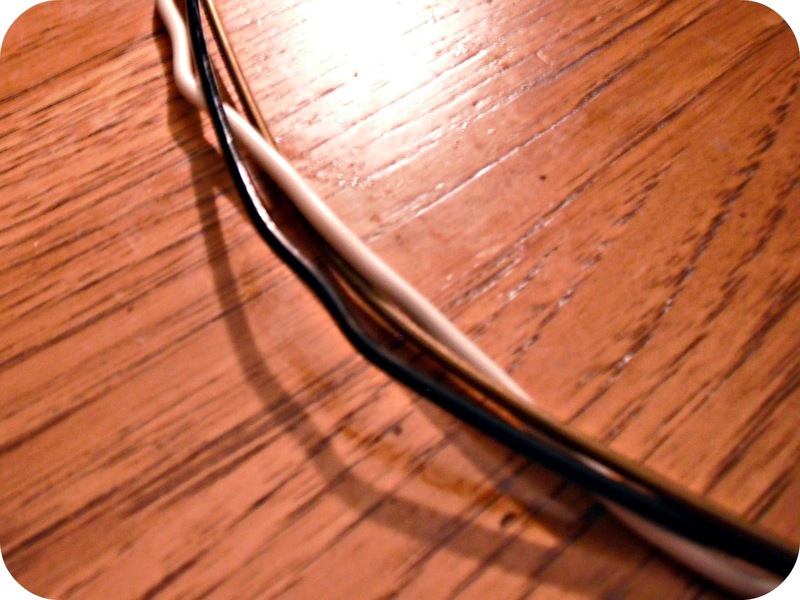 You may need to use your pliers to get in between your wire. When you reach the end of your strip make another set of tails and tie it off. Continue until you go all around the wreath. On your last strip wrap the bottom of your wreath hook to make it look cleaner. 6. Cut your ribbon into 6- inch strips. Keep 4-6 strips aside and tie the rest onto the wreath with a square knot to fill out any more empty open spaces. 7. 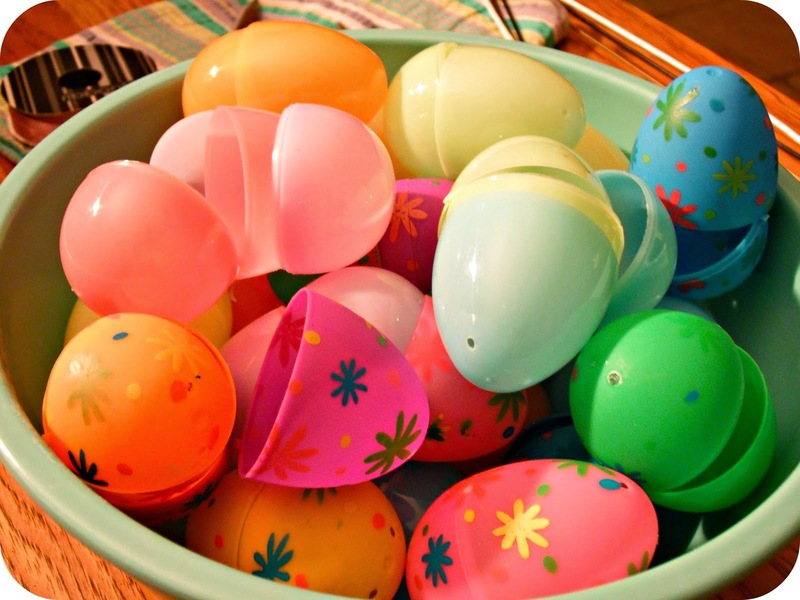 Pull out your stash of plastic Easter eggs. 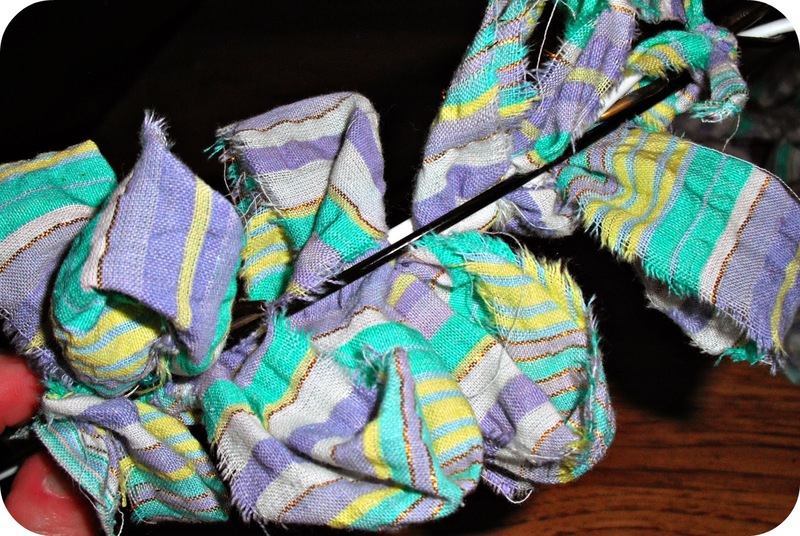 Thread the eggs onto your string loosely. To do this open your egg and push the string in and out of the holes on the top and bottom, then reseal. 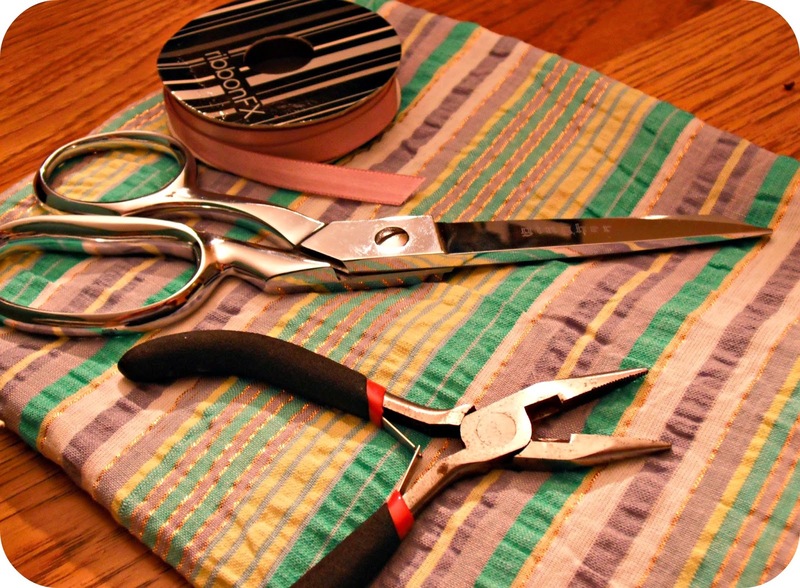 If the holes are not big enough for your string, use the tip of your pliers or scissors to widen it. 8. 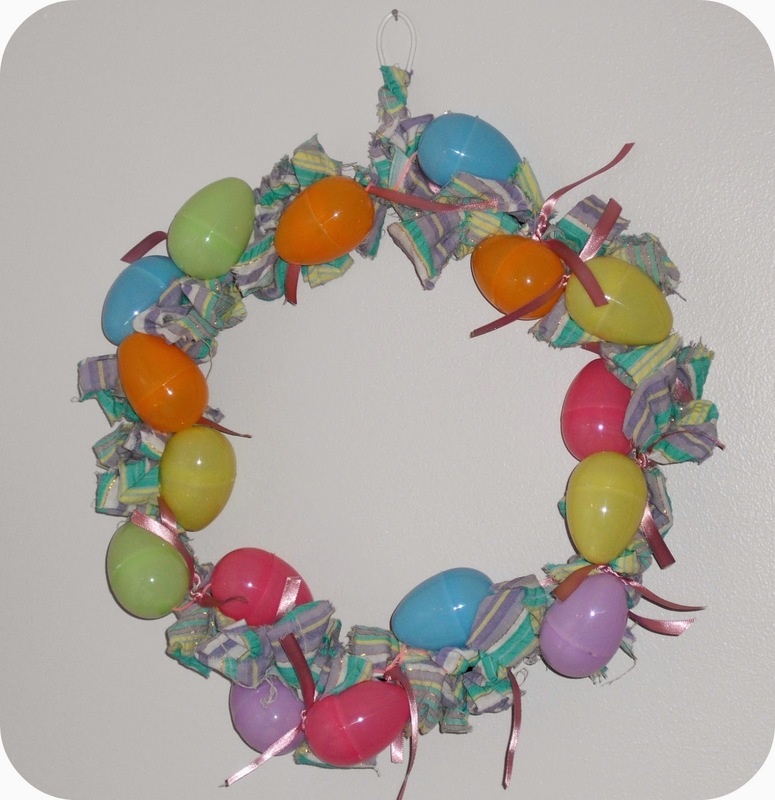 Starting on the opposite end of your wreath wrap your egg string around positioning your eggs. 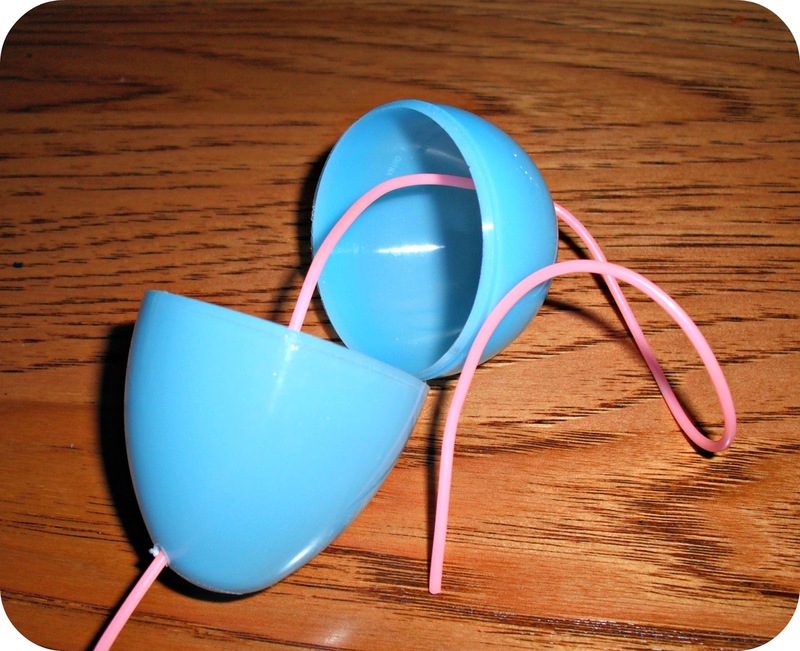 Slide the eggs along the string to help place into position. 9. Tie your egg string together at the top and trim off any extra. 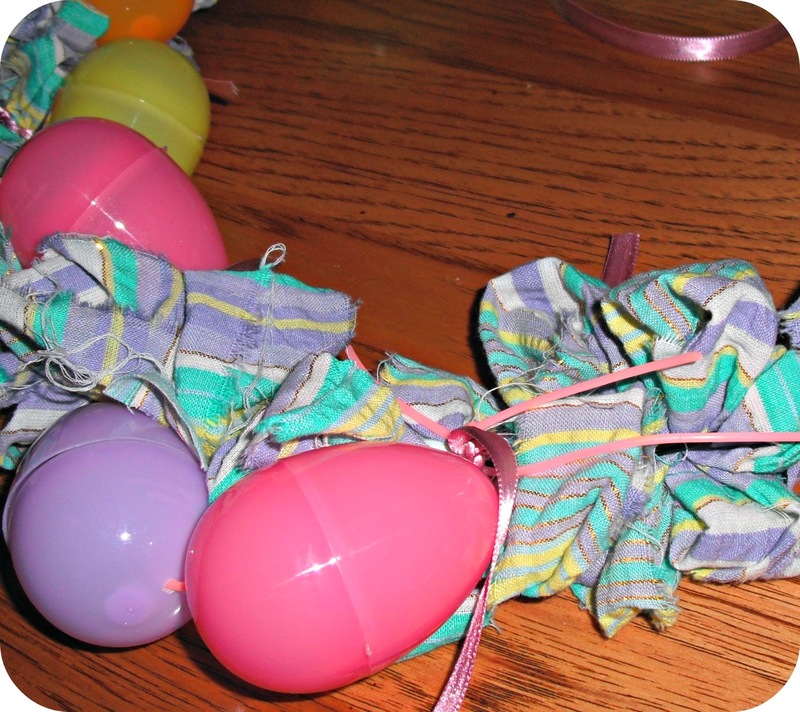 Use your reserved ribbon pieces to tie in place to secure placement of your eggs. Fluff your loops if they were mashed by your egg string. 10. Hang up and say PREEETTY! What do you think? Does it need a big obnoxious bow, too? Nice job! I am making an Easter wreath myself with lots of flowers and not so many eggs, but this is a great idea! Thank you. Apparently my new love is cheap decorations. That should come easy to me considering the craft supply hoard I have. Thank you, sophie. I am still finding bits and pieces of eggs when I clean. Maybe a second wreath is in order.